In today’s Wall Street Journal drama column I review an off-Broadway revival of A.R. Gurney’s Later Life and the Broadway premiere of Frozen. Here’s an excerpt. When a prolific artist dies, it takes time to sort through his output and decide what—if anything—is likely to last. That’s happening right now to the four dozen plays of A.R. Gurney, the bard of the upper-middle-class WASP, who died in June at the age of 86. “The Dining Room,” “The Cocktail Hour,” “Love Letters” and “Sylvia” continue to hold the stage and assure him of a place in the history of postwar American theater. And what of the others? Many, like “Black Tie” and “Indian Blood,” are little more than high-class comfort food for country-club Republicans. 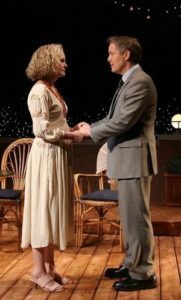 But Mr. Gurney was no four-hit wonder, and the Keen Company’s off-Broadway revival of “Later Life,” first produced by Playwrights Horizons in 1993 but rarely seen since then, is a welcome reminder that there are glittering gems lurking amid the paste. Unflashy conversation pieces like “Later Life” don’t play themselves. They must be knowingly cast and intelligently directed to make their full effect, and Keen Company, here as always, is up to the challenge…. “Frozen,” the Disneyfied version of Hans Christian Andersen’s “The Snow Queen,” has now been turned into a stage musical and brought to Broadway. It’s unlikely that anything else I say about “Frozen: The Broadway Musical” (to give the show its full official title) will sway those parents who already plan to take their children to see it, so I’ll be brief: If you liked “Frozen” on screen, you’ll like it onstage. Michael Grandage’s fantastically elaborate production, choreographed by Rob Ashford and designed to the hilt and beyond by Christopher Oram, is faithful to the spirit, if not always the letter, of the movie. For my part, I found both to be well-made but insipid and largely humorless, though the stage version is more tedious…. To read my complete review of Later Life, go here. To read my complete review of Frozen, go here.